Delighting in our children begins as we learn to delight in their unique BENT. Let’s face it, some kids are harder to connect with than others. Some kids challenge us as parents to learn how to delight and encourage their unique bent. Every child is precious, but even good parents can become discouraged by frustrating aspects in their child’s makeup and personality. Add other complicating factors, including the hurried pace of life and learning differences, and even the best of parents can become overwhelmed. Even as a “good” parent, you may become discouraged if you don’t understand why your child behaves as he or she does. For now, just know this: You’ve been given an exclusive opportunity: the chance to nurture a child who is like no other. So learn to choose the child you’ve been given. And learn to delight in them. I’m so glad God gave me you as a daughter/son. You bring me so much Joy. I really like reading to you. It’s so fun to have tea parties with you. I had fun with you today. 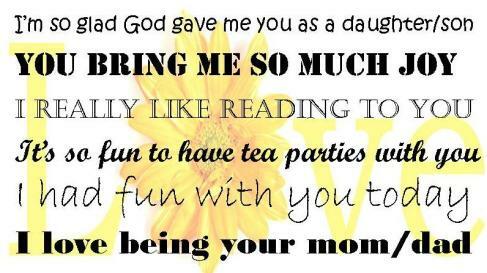 I love being your mom/dad. What’s sweet is that since toddlers are mini parrots many times they end up saying the same things to you later. These Life Words are a way of communicating DELIGHT. Let’s look back at the chart to our bottom half of the circle. In Part 1, we looked at the Secure Base. In addition to that, children need a safe haven to return to. Children come to their parents and move away over and over again. As children get older they are likely to venture further from their secure base, and stay away longer, but still need to know that they are welcome to come back. Security of attachment requires a caregiver who is sensitive and responsive to her/his child’s needs. Your willingness to answer subtle requests for attention, comfort, holding, exploration, and discovery (with you nearby) will provide an increased sense of security for your child. Protect your child, when things are too overwhelming or even dangerous, draw them into you. Comfort them – as you draw them in, provide comfort to them. Hold your child – Babies and toddlers soak up affection and love through their skin. Holding your child not only provides pleasure and reassurance, it is essential in helping to soothe and organize difficult feelings. Eye contact – Gaze into your baby’s eyes from the first day of life, and pay close attention to when your child wants to look back. At about six weeks, your child will regularly focus in on your eyes and read what they are “saying.” Lots of pleasurable eye contact will translate into a feeling of reassurance and connection for your baby that will spill over into childhood. Now just a captured glance across a room is enough for my 9 yr old to regain her sense of security. She doesn’t need to come back to me physically, she comes back to my safe haven emotionally by remembering that I am here, that I love her. Delight in your child– here it is again. This idea is so profound, so significant to attachment that it is found on both sides of the circle. Your child need to feel welcomed back to you. If they “explored” just a few steps away, or they have been off and running for 30 minutes, when they return they need to experience your delight. Too often we have an annoyed response when our kids come back to us. Maybe we are in the middle of a chore, or a conversation, and their interruption is inconvenient, so we usher them away with a “Go back and play”, not realizing that they need to come into our safe haven in order to feel secure enough to play again. We need to learn to greet them with delight EVERY time. A smile, a hug, an encouraging word, allowing them to drink their fill of us before they go out again. Another need is help to organize their feelings. Babies and children need support when they face feelings that are too intense to manage by themselves. This support is most effective when parents accept the child’s feelings and don’t try to get them to feel something different. Easier said than done! So embrace your child’s unique bent, work on using Life Words, create security of attachment and delight in your child today! Almost all children will develop an attachment but the nature of attachment varies, depending largely upon the care-giving style of their parents. Children who are securely attached are more likely to be resilient under stress, have better relationships, and enter school ready to learn. For better or worse, the infant brain is profoundly influenced by the attachment bond—a baby’s first love relationship. Research has found that when the primary caretaker can manage personal stress, calm the infant, communicate through emotion, share joy, and forgive easily, the young child’s nervous system becomes “securely attached.” The strong foundation of a secure attachment bond enables the child to be self-confident, trusting, hopeful, and comfortable in the face of conflict. As an adult, he or she will be flexible, creative, hopeful, and optimistic. As you read through that description, I am sure that every one of you thought to yourself, “YES, I want THAT, for my child”. But how do I know that my child’s attachment to me is SECURE? 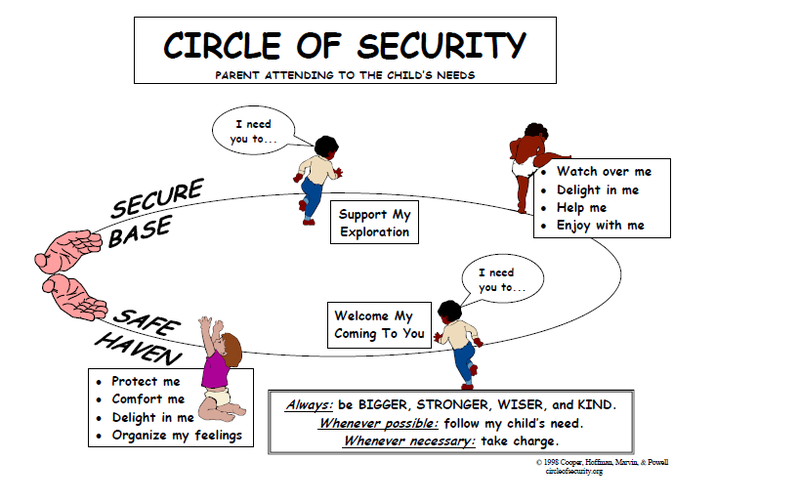 Drawing on attachment research a group of American psychotherapists have developed a user-friendly graphic illustrating the different needs children have of their parents, named the Circle of Security (COS) (Cooper, Hoffman, Marvin & Powell, 1998). When a child can move safely through the circle, it is indicative of a secure attachment with their parents. In this graphic the hands represent the parent, and the circle represents the child moving away to explore and coming back when necessary. To develop a secure attachment, children require their parents to fulfill two key roles. Firstly (on the top half of the circle) the parent’s role is to be a secure base from which the child can move away and explore their world. Secondly, children need a safe haven to return to. Exploration: For a baby this may be subtle, looking away from mom as something catches their interest, for a toddler with new-found mobility, it may be more obvious! Our toddlers and preschoolers are always out exploring something! This is an important role as it is through exploration that a child’s learning occurs. The important thing about exploration is that children are more likely to explore when they feel safe and look to their parents for cues that it is OK. We have all seen that child that is hesitant to explore, that clings to mom, rather than venture out. In fact, that might be your child. You may make excuses to your friends about your child being “just shy” or “slow to warm up”, but you can sense your child’s anxiety about leaving you. This has more to do with the child’s relationship with you than it does anything else. If you can understand what your child needs from you to feel safe to explore, it can make this transition easier. There are several distinct needs that a child has while exploring. First, they need to know that you are watching over them. They need to know that you are managing their safety so that they can feel safe to explore. Think about the number of times your child turns back to you for a reassuring “you’re ok”, before continuing to explore. Sometimes they need help, ideally just enough to do the task themselves, without the parent taking over. This is called scaffolding. Third, Children need their parents to enjoy their adventures and achievements with them. These are the “You did it!” moments. Whether that be celebrating a first step or first time down the slide by themselves. But perhaps most significantly they also need to know that their parents delight in them, just for being who they are (as distinct from what they do) and experiencing lots of genuine delight is likely to lead to a secure attachment. There it is. No pressure, no expectations. Just enjoyment of the child themselves. My kids are involved in a LOT of activities: soccer, swim team, dance team, taekwondo and on and on the list goes and grows. At the end of every practice that I take my children to, their question is the same, “Were you watching?” But the real question isn’t just “Did I see”, but did I Enjoy… did I DELIGHT? When we delight in them, we can stop watching their skill, and start noticing the joy on their faces, the strain as they work through a task, the pain of a miss… we can empathize with their feelings and stay intimately in tune with them. We worry less about performance, and focus more on the amazing gift that is our child. Babies are actually “hard-wired” to experience joy with their caregivers in the early months of life. Researchers are finding that mutual joy is the basis for increased brain growth. Our children need to know, beyond a shadow of a doubt, that they give us JOY. What Delight communicates: I love YOU, I like YOU. My love and my like are not dependent on what you do (or don’t do). Sometimes, as parents, we struggle to delight in our children, especially when they are exploring, because we are too focused on performance expectations. Sometimes we sit comparing them to other children and wish that they would be more… outgoing, athletic, focused, articulate, or less…serious, assertive, artsy, emotional. Part of the challenge of delighting in our child is to delight in your child as an individual.